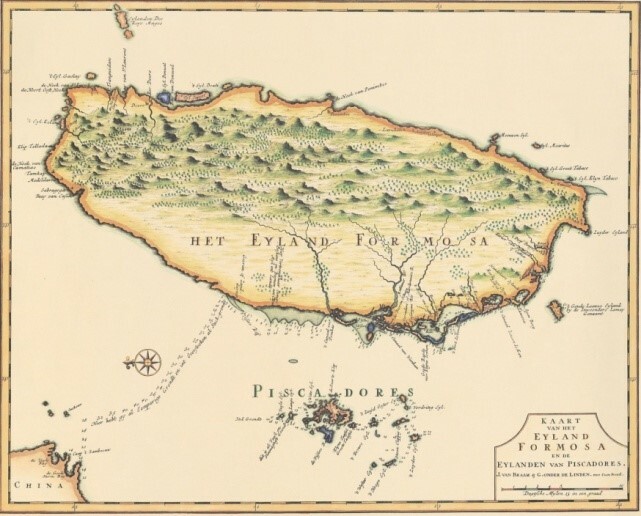 In the 16th century, Portuguese ships sailed to Southeast Asia and discovered Taiwan. Sailors aboard these ships were enchanted by the island's natural beauty and majestic scenery. They exclaimed "Ilha Formosa!" This means "beautiful island" in Portuguese. Ever since, the name has become synonymous with Taiwan. Taiwan is an island shaped like a leaf that is narrow at both ends. It is located on the western edge of the Pacific Ocean with a total land area of about 36,000 square kilometers (14,400 square miles). It lies off the southeastern coast of mainland Asia, across the Taiwan Strait from China. To the north is Japan; to the south is the Philippines. 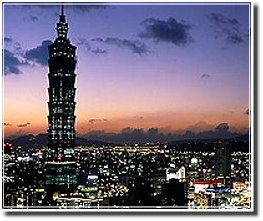 Many airlines fly to Taiwan making it the perfect travel destination. Taiwan lies on the western edge of the Pacific "Rim of Fire," and continuous tectonic movements have created majestic peaks, rolling hills and plains, basins, coastlines, and other natural landscapes. 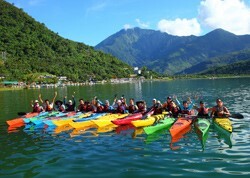 Taiwan's tropical, sub-tropical, and temperate climates provide clearly distinct seasons.. There are rare or endangered species on the island. Among these are the landlocked salmon, Taiwan serow, Formosan rock monkey, Formosan black bear, blue magpie, Mikado pheasant, and Hsuehshan grass lizard. If you are from a high-latitude country, you can leave your winter coat behind when coming to Taiwan and enjoy the pleasant warmth of the sun. If you'd rather experience the carefree sensation of healthy beads of sweat running down your forehead, then you should visit the beach at Kending (Kenting) in southern Taiwan where it is summer all year round. Don't worry too much about getting burned by the dazzling sun so long as you take prudent precautions. The sun may not be as stinging hot as it seems. Furthermore, the country is surrounded by the ocean that has a nice warm breeze giving Taiwan a humid weather and will surely make you completely forget the dry cold back home.. If you want to observe the multifaceted manifestations of 5,000 years of culture, or feel for yourself the joy and harmony of life in a heterogeneous society, then a tour of Taiwan is just what you need. Perhaps the best thing about experiencing the endless variety of Taiwan's cultural and artistic wonders is that whatever you like, whether it be folk festivals, religious practices, traditional skills, or modern art, everything is right at hand. You can find expressions of the country's rich and varied arts on every street and lane, and in the lives of the people. Every part of Taiwan - north, center, south, east, and even the offshore islands - presents its own unique local characteristics, profoundly different yet centered on a common cultural core. This is the source of Taiwan's magnetic allure. Taiwan has a population of 23 million. The larger part of the country's inhabitants are the descendants of immigrants from the various provinces of mainland China, but in particular from the southeastern coastal provinces, Fujian and Guangdong. Because the different ethnic groups have fairly well integrated, differences that originally existed between people from different provinces have gradually disappeared. Nearly 500,000 indigenous people, the original inhabitants of Taiwan, still live here. There are 16 different tribes, namely Amis, Atayal, Paiwan, Bunun, Puyuma, Rukai, Tsou, Saisiyat, Yami, Thao, Kavalan, Truku, Sakizaya, Sediq ,Kanakanavu ,and Hla'alua. 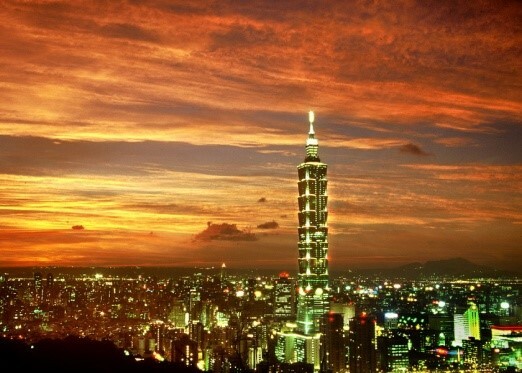 Taipei is Taiwan's largest city as well as its economic, political, and cultural center. It is a modern cosmopolitan metropolis with a lively and diversified face filled with exuberance. From the world's tallest building (2004-2010) to the biggest collection of Chinese art, Taipei invites you into a world of fascinating contrasts - a mix of the modern and traditional, with a generous dash of energy and friendly smiles to make this one of your most memorable trips to Asia. The cultural kaleidoscope of Taiwan's capital city pulses wherever you go. Incense veiled temples dating back to dynastic times blend seamlessly with a neon street life of a decidedly more modern era. Taipei has dozens of world class restaurants where gourmets can sample the best regional Chinese cuisine; and for the gourmand, there are plenty of night markets serving up scrumptious evening snacks in an environment of chaotic excitement and fun. The polarities of Taipei are vividly present as well in the joining of the urban and natural. Just a few minutes from the heart of the city you can soak away the cares of the world in mineral-rich hot springs nestled in the lush mountain foothills surrounding the Taipei Basin. And throughout the city there are plenty of trails, parks and other oases of tranquility to lift and invigorate your spirits. Whether you're just stopping over en route to another Asian destination, or planning a longer stay, Taipei is a many-faceted treasure that will call you back again and again. 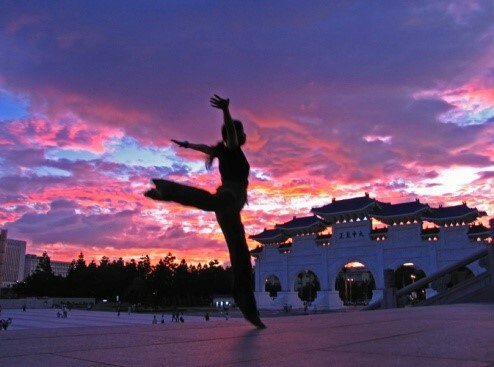 Discover the heart of Asia in beautiful Taipei! Taipei 101 has a mass of shops on the lower floors that incorporate many top brands under the LVMH group, such as Louis Vuitton, Dior, Celine, etc. The fourth floor houses the Page One bookstore from Singapore, with the highest roofed coffee house in Taipei and many fine restaurants. 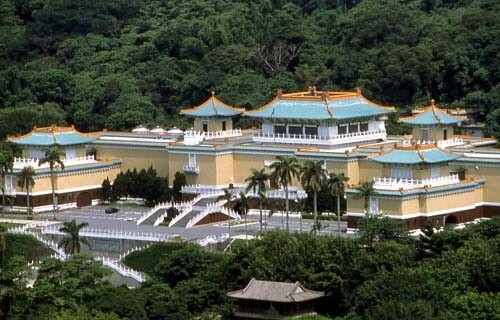 The National Palace Museum houses the world's largest collection of priceless Chinese art treasures that spans China's nearly 5,000-year history. Most of the museum's 620,000 art objects were part of the Chinese imperial collection which began over 1,000 years ago in the early Song dynasty. Shilin Night Market is the one of the largest night markets in Taipei. 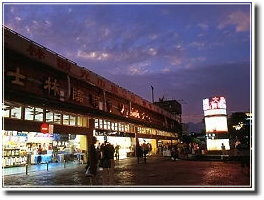 Shilin Market was built as early as in 1899 and the market is famous for various snacks and eatery. Many visitors have come to Shilin Night Market to enjoy the delicious foods such as little bun wrapped in big bun, stone hot pot or Shilin sausage. 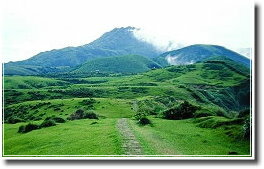 Yangmingshan National Park is the only park in Taiwan that has volcanic geography and hot springs. The magnificent mountainous scenery and comfortable weather have made Yangmingshan National Park a perfect summer resort. The natural beauty of the park has won it the reputation as urban forest and the Taipei garden. 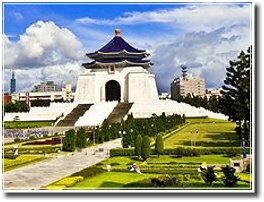 Chiang Kai-shek Memorial Hall is located in the heart of Taipei City. The area is 250,000 square meters and it is the attraction most visited by foreign tourists. Outside the gate of Chiang Kai-shek Memorial Hall, there are poles carrying the sign of true rightness. 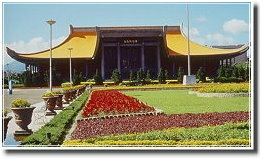 Sun Yat-sen Memorial Hall was built in 1972. 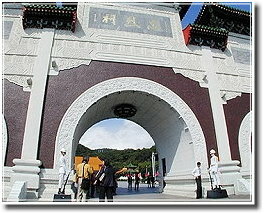 It is located on east side of Taipei and is close to the Taipei City Government. The memorial hall was built to commemorate the great founding father of R.O.C., Dr. Sun Yat-sen, and was built on the 100th birthday of Dr. Sun. 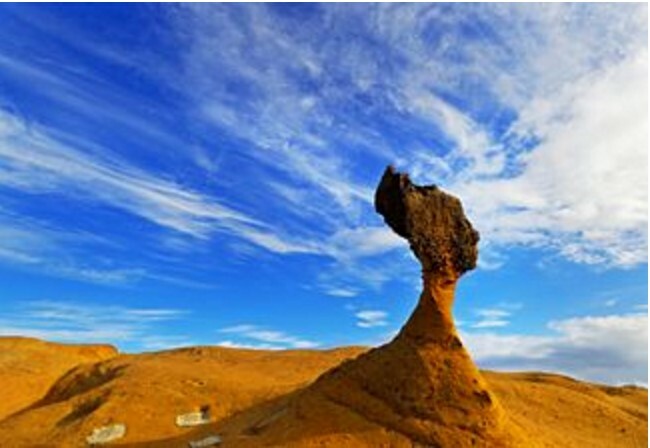 Yeliu is famous for its spectacular wind-eroded rock formations called 'hoodoo stones' and sea gullies, which have created a dramatic landscape with intriguing spots like the Candle Rocks, Mushroom Rocks, Tofu Rocks, Honeycombed Rocks, Pot Hole and Melting Erosion Panel. The Queen's Head (now in danger of breaking), the Fairy Shoe and Candle Rocks enjoy international fame. 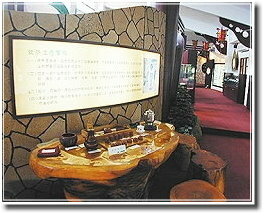 Beitou hot spring has been famous since Japanese colonial times. 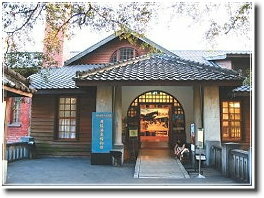 The area is surrounded with historic monuments and natural scenic spots. The hot springs hotels in this area are larger both in scale and number, and the natural and manmade resources are also the most plentiful here. 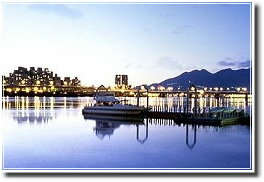 Danshui is located in the northwest of the Taipei basin. Danshui is surrounded by mountains and rivers and the scenery is beautiful. Take the ferry across the river from Danshui, and in just six minutes you will arrive at Bali Left Bank. Additional scenic spots of interest include Danshui old street and Fisherman's Wharf. Jiufen (Jioufen) used to be the center of gold mining. 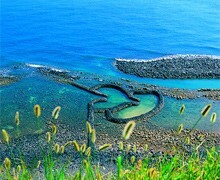 It is located within the hills in the northeast of Taiwan. The village is next to the mountain and facing the sea. The village once was the gold city of Asia and was called little Shanghai or little Hong Kong. 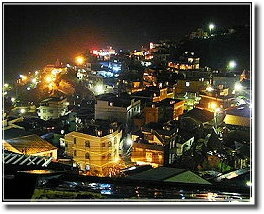 However, with the decline of gold mining activities, Jiufen (Jioufen) fades. The tea farms here are famous for Bouzhong tea and Taiguan Ing. There are many teahouses with diversified styles. They are good places to visit no matter during the day or night. In the daytime, there are tea trees and hills forming green scenery. Many citizens visit the place by taking the mountain tracks. After dusk, Maokong is like an enchanting, mysterious lady. 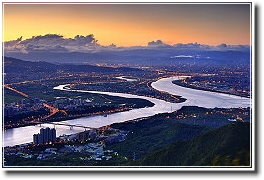 Since early times, the Keelung River and Danshui River have been major transport waterways through the city of Taipei. Today, the ship no longer ferry goods and commuters, but rather carry passengers attracted by the city's riverside charm. 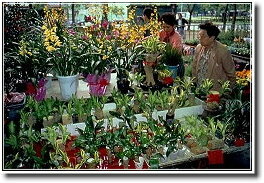 Besides flowers and plants, Jianguo Holiday Flower Market also sells floral instruments and seeds. This is obviously a heaven for gardening lovers. 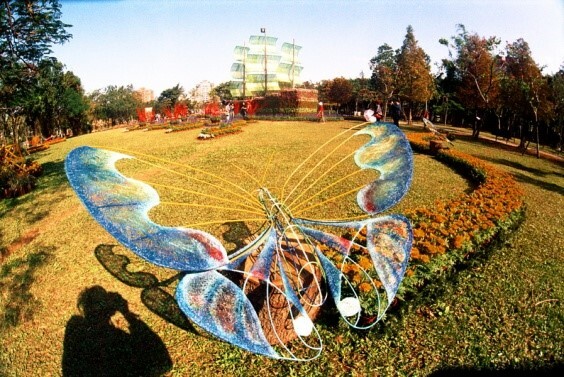 The Da'an Forest Park is sited just right beside the Jianguo Holiday Flower Market; hence it is definitely the best location to admire or buy flowers. Next to the flower market, the Holiday Jade Market offers a wide selection of jade goods. 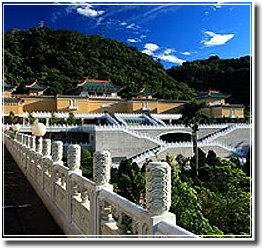 The Martyrs' Shrine, resting on the slopes of the Qing Mountain and overseeing the Keelung River, is located right next to the Grand Hotel. It was built in 1969 and covers a large area. Its grand and magnificent architectural style is similar to that of the Taihe Dian Imperial Palace in Beijing, Mainland China, and symbolizes the martyrs' brave spirit. 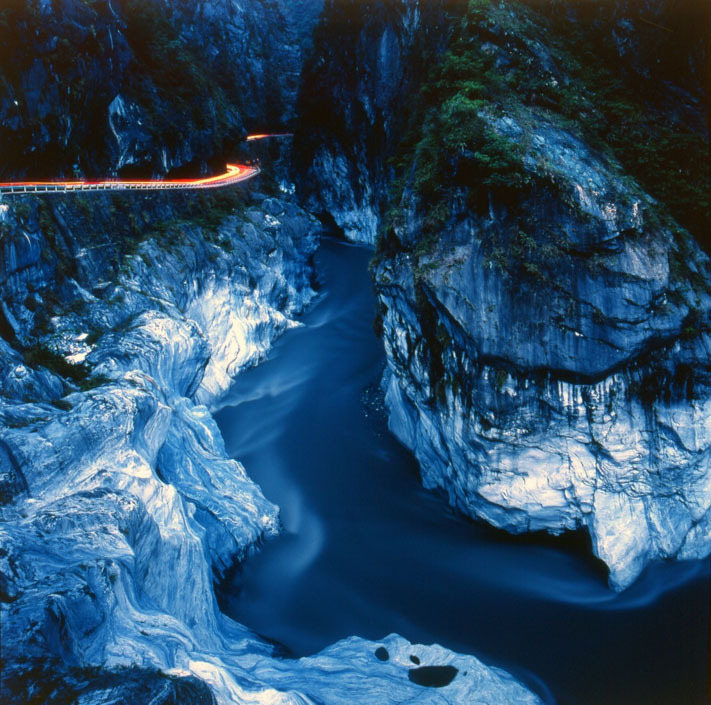 Taroko is famous for its spectacular mountains and marble canyons. Cliffs and canyons stretch along Liwu River. Four million years ago, the island of Taiwan was formed by the collision of plates. After millions of years of wind erosion, the marble rocks were exposed and cut by Liwu River, creating impressive grand canyons. From Qingshui to Nanhu Peak, the drop height is 3,742 meters. Such special geography has also bred special flora and fauna in this area. The waterfalls characterized Taroko National Park and the most famous ones are Baiyang Waterfall, Yindai Waterfall, Changchun Waterfall, and Lushui Waterfall. Swallow Grotto (Yanzikou) and Tunnel of Nine Turns (Jiuqudong) are the most impressive natural scenes in Taroko and the canyons here are the narrowest. Tourists can appreciate the natural beauty along the tour track. Swallows nest on the cliff, chirping and flying back and forth. 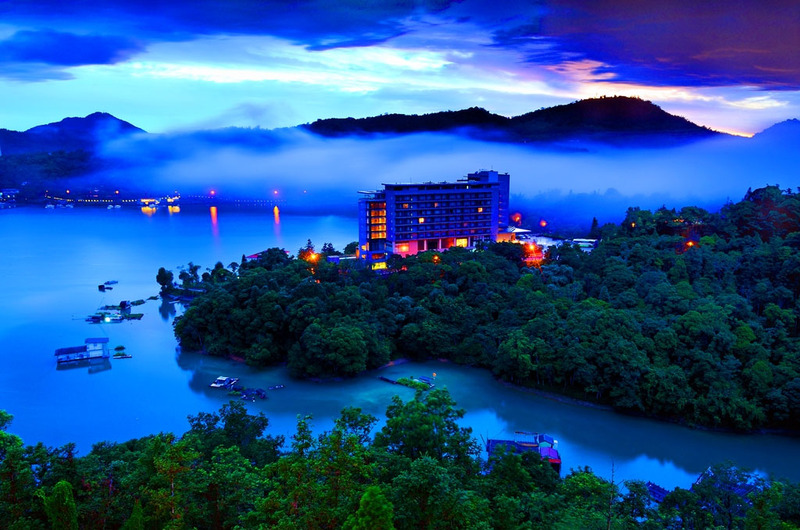 The Sun Moon Lake, located in the middle of Taiwan, with an elevation of 748 meters above sea level, is the only natural big lake in Taiwan. The southern part of Lalu Island is shaped like a new moon, and the northern part is shaped like a sun; hence the name Sun Moon Lake. The most famous sights around Sun Moon Lake are the Itashao, Lalu Island, the Xuanzang Temple, the Ci-en Pagoda, and the Wenwu Temple and so on. The natural forests bordering these roads are good places for bird watching. 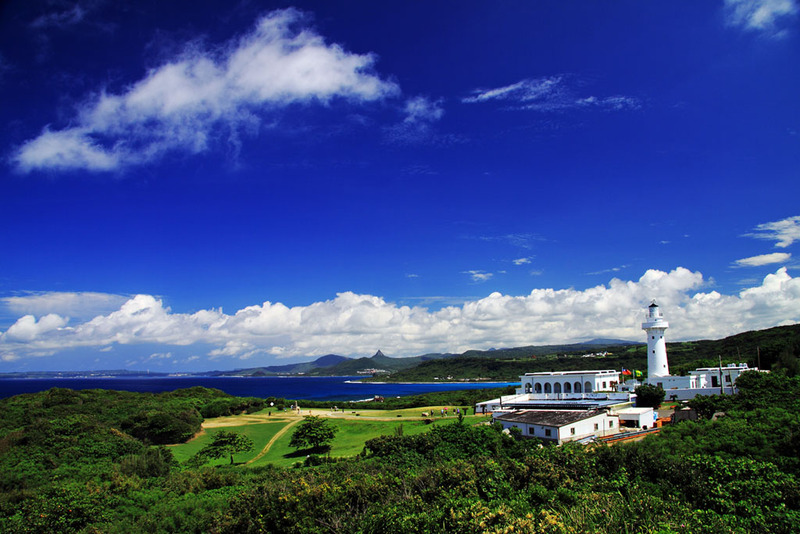 The centerpiece of the Hengchun Peninsula is Kenting National Park, Taiwan's most densely populated and only tropical national park. It includes large stretches of agricultural lands, providing visitors with a view of typical Taiwanese rural life. 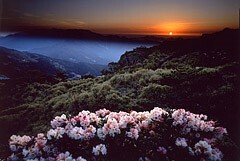 In addition, the national park includes mountains, forests, pasture, lakes, sand dunes, beaches, and coral reefs. It has everything you could desire when you want to get up front and personal with Mother Nature. Keynote videos and slides are online. Photos are also available! Congratulations to Best Paper Award, Design Contest Award, and Design Contest Honorable Mentions! For attendees stayed at Howard International House, ISLPED shuttle bus is available every morning. Download the ISLPED 2017 Whova App! Design Contest: Demo videos are posted! Advance program (HTML | PDF) is now available! Camera-ready paper submission instructions are posted! Please follow the instructions to prepare your final paper. Conference registration is now open! The early-bird registration deadline is June 23. Design Contest: Submission deadline is extended to May 10. Design Contest: Submission site can be accessed here! Hotel information is now available! The ISLPED 2017 abstract and submission deadline have been extended by one week. No further extensions will be granted. Submission site is online now! Note: Please use IEEE template and follow COI definitions for the submission. Design Contest: CFD is now posted! CFP is up and can be accessed here! ISLPED 2017 website is up!